Welcome, Catherine! Happy 3rd birthday to Story Snug! Celebrating birthdays and anniversaries are so important and we are happy today to celebrate with you and your success as a blogger. Catherine, please tell us about yourself. Where you are from, where do you live now, family, occupation and any hobbies besides blogging? I'm from southern England and until I came to Germany I had always lived by the sea! Now I live in southern Germany, miles away from the sea! I live with my German husband and our seven-year-old daughter. I trained as a primary school teacher, but since living in Germany I've also worked as a proofreader and translator. My hobbies are spending time with my family, writing, reading, gardening and cooking. 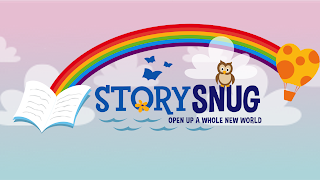 What was your inspiration for creating Story Snug? A combination of my first local SCBWI meeting three years ago and watching the film Julie and Julia. During our meeting we talked about having a presence on social media and writing regularly. We also talked about blogs but it wasn't until a few days later, while I was watching the film, that my husband and I talked about setting up a blog. Friends often asked me which books I recommended they read with their children so Story Snug was a natural extension of conversations that I was already having and was why I started writing about picture books that we like. How did you come up with the name, Story Snug? My husband and I talked about words related to reading and stories and somehow we came up with that combination of words. I liked the idea of snuggling up with a book and originally, because of the expat connection, the blog was called Story Snug: Picture Book Recommendations for Little People Near and Far. After a year we redesigned the logo and changed it to Story Snug: Open Up a Whole New World, as we were no longer just recommending picture books. Now the logo reflects the fact that all kinds of books can transport you to other worlds and also encompasses the changes in our reading habits as my daughter gets older. I've read a wide range of picture books, which has influenced my own picture book writing. Reading widely has helped me to understand more about structure, plot and character in picture books and see what works well and what doesn't. I've connected with lots of lovely authors, illustrators and publishers on social media, particularly Twitter. Sometimes Twitter conversations have resulted in authors and illustrators writing guest posts or doing interviews for Story Snug as well as offering their books as prizes for giveaways. I've also gained a lot more understanding of the writing / publishing / book marketing process through making these connections. We receive many wonderful newly published books to recommend so we always have something new to read. Now that we are reading more chapter books it's also a great way for me to become aware of some of the newer books that are being published for older children. In the past 3 years what have been a few of your favorite moments with Story Snug? Every time a parcel of new books comes through the post is a great moment! I've really enjoyed doing our Advent Calendars. We have two little men, Christmas and Snowy, and they bring us a book every day and put together a scene with characters from the book. It was so much fun to do and great to see the surprise on my daughter's face when she saw what they had been up to! They won't be back this year, I have something very different planned which I am extremely excited about! I love taking part in International Book Giving Day, which takes place on February 14th every year. Its aim is to get a book into the hands of every child and it's been great to be able to spread the word through Story Snug. I was nervous but also excited to be asked to do my first telephone interview with UK children's television presenter Cerrie Burnell who has had two of her books published this year. It was fun and not as nerve wracking as I thought it would be. Cerrie was very easy to talk to and very passionate about her writing. What are some of your favorite children's books, new or old? I love Owl Babies, The Old Bear Stories, the Winnie the Witch stories, Teddy Robinson, Mrs Pepperpot and The Moomins. Newer favourites include The Little Raindrop, What the Ladybird Heard, the Claude and Sir Bobblysock stories, Press Here, Wanted! Ralfy Rabbit, Book Burglar and The Fairytale Hairdresser stories. Do you have a certain demographic of readers on your blog? Are there more German or English speakers? I'm not sure, my blog statistics tell me that I have readers all over the world, but I have no idea whether the readers are German or English speakers. When I recommend a book I always try and find translated versions of the books that I blog about (although as I haven't read the translations I can't vouch for how well they have been translated). I know of English speaking parents who read Story Snug, but don't have children who understand English so it's great to find them a version of a story that they can read in their native language. What challenges have you had with running a blog while working, raising a family and writing of course? The challenges for me are with the technical side of the blog. My husband takes care of the technical side, Story Snug is very much a joint effort and without him as technical back up I would struggle! I'm not working at the moment so I write blog posts when my daughter is at school or during swimming and dancing lessons. I always have a few set up so I can edit on my phone, it's always good to have a few back up posts written so that you can still post regularly even if other circumstances get in the way. How long have you been a member of SCBWI? And what genre do you write in? Are you published? I have been a member of SCBWI for about four years and went to my first meeting three years ago. Since then I have attended conferences and workshops in the UK, France, Germany and The Netherlands. I write picture books and am currently unpublished. Do you have any upcoming author/illustrators that you will be interviewing on Story Snug soon that we can mention? Nothing is confirmed yet but I've been in contact with three authors recently who have agreed to write guest posts. I leave the timings of the posts up to them so that they can fit them around their own schedules. Sometimes authors, illustrators or publishers approach me about interviews and blog tours, especially around publication date. It was a lot of fun taking part in Hazel Mitchell's 'Imani's Moon' blog tour and Rebecca Colby's 'It's Raining Bats and Frogs' blog tour, they're both SCBWI members that I have met at conferences. We do love having visitors on Story Snug so if you are an author or illustrator who would like to recommend your favourite picture book please do get in touch. Plus, let me know any other bits of fun things you want us to know about you or Story Snug! The books on the blog are only books that my daughter (mainly) and I like. Now she's older she will immediately tell me when she likes a book and thinks that we should recommend it on Story Snug. After I had been blogging for a while the teacher side of me crept in so that now as well as recommending a book we often do an accompanying craft or activity. The most viewed posts on Story Snug are the Learning Activities posts where we focus on a book and suggest crafts and activities that are related to the book. And finally, what tips do you have for others who want to start a blog? Read lots of blogs! They'll give you ideas for what you want to blog about as well as what you don't want to blog about! Don't try and copy anybody else's style. Be yourself and don't be afraid to experiment with the kinds of posts you write. Think about your audience. If you read a blog post what is important or interesting for you to know? What do you feel is important information for your reader to know about a particular subject? Be prepared to reply to blog post comments, it takes time but it will help you to develop a relationship with your readers. Be patient! It will take time for a blog to become established and for you to build up a community of regular readers. If you really want to reach a bigger audience you'll need to be active on social media so that you can connect with others who have similar blogs or are experts in the area that you have chosen to blog about. Write several posts and share the links with friends before your blog goes live so that they can comment and give their opinions. That way when you publicly share your new blog link there are more posts for people to read to get to know you and your writing style. When I visit a new blog for the first time I like to know more about the person writing the blog. Personally if somebody starts a blog with just one post I don't go back until there's a lot more content. Thank you so much Catherine for sharing about yourself and your blog Story Snug. It sounds like you've had some great successes and I look forward to reading more about the books you (and your daughter!) recommend. I am a librarian in Munich and love to hear about books children love and want to read! Plus your posts about books and suggested craft ideas are brilliant, I will be sure to pass these ideas on to other teachers I know, too. Thank you for your creativity, for it inspires all of us keep our own creative juices flowing, too! 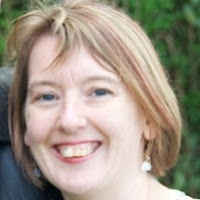 Please go on over to http://storysnug.com and say hello to Catherine. You can also follow her on Twitter, Facebook, or Pinterest or check out some of her other links below for more information about her blog tours or International Book Giving Day. Tracey Jaffart is a librarian in a bilingual school in Munich. Her debut children's short story will be published in Hopscotch magazine next year.